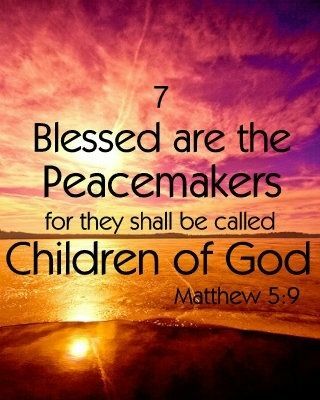 This is the seventh of the beatitudes: and seven was the number of perfection among the Hebrews. It may be that the Savior placed the peacemaker seventh on the list because he most nearly approaches the perfect man in Christ Jesus. He who would have perfect blessedness, so far as it can be enjoyed on earth, must attain to this seventh benediction and become a peacemaker. There is a significance also in the position of the text. The verse that precedes it speaks of the blessedness of “the pure in heart, for they shall see God.” It is important to understand that we are to be “first pure, then peaceable.”1 Our peaceableness is never to be a contract with sin or toleration of evil. We must set our faces like flint against everything that is contrary to God and His holiness: When purity in our souls is a settled matter, we can go on to peaceableness. In the same way, the verse that follows seems to have been put there on purpose. However peaceable we may be in this world, yet we shall be misrepresented and misunderstood; and we should not be surprised, for even the Prince of Peace, by His very peacefulness, brought fire upon the earth. He Himself, though He loved mankind and did no ill, was “despised and rejected by men; a man of sorrows, and acquainted with grief.”2 Just in case the peaceable in heart should be surprised when they meet with enemies, the following verse reads, “Blessed are those who are persecuted for righteousness’ sake, for theirs is the kingdom of heaven.” So, the peacemakers are not only pronounced to be blessed, but they are surrounded with blessings. Lord, give us grace to climb to this seventh beatitude! Purify our minds that we may be “first pure, then peaceable” and fortify our souls, that our peaceableness may not lead us into cowardice and despair when we are persecuted for Your sake.